A family looks to prevent evil spirits from trapping their comatose child in a realm called "The Further". $13.271 million on 2408 screens. When some people see “from the makers of Paranormal Activity” attached to another movie, they feel intrigued. When I view that statement, I feel dubious. I thought Paranormal was a whole lotta nothin’, so I was afraid 2011’s Insidious - the connected film in question – would be a whole lotta more nothin’. However, I heard some good reviews for it, so I felt it was worth a chance. We meet the Lambert family: young married couple Josh (Patrick Wilson) and Renai (Rose Byrne) plus their kids Dalton (Ty Simpkins), Foster (Andrew Astor) and baby Cali. They move into a new house and have to deal with related adjustments. Along the way, some spooky weirdness occurs at the house, and Dalton ends up in a coma for no medically discernible reason. He remains in this state for three months and ends up cared for in the home, at which point matters become even spooky weirder. One day Renai hears scary voices from Cali’s baby monitor, and Foster reports that he feels afraid of his brother who “walks around at night”. Renai suspects they live in a haunted house – and matters indicate that she just might be right, though the family’s problems seem to extend beyond their new abode. When the Blu-ray’s packaging noted that Insidious came from some of the people beyond Paranormal Activity, I didn’t realize that this meant it would offer a semi-remake of the 2009 hit. To be fair, both don’t share a slew of similarities, but there are enough to make them kissing cousins. Both offer house-based horror that builds slowly, and they come with lead actresses who believe in the supernatural and lead actors who opt for denial. Does this mean that if you don’t like Paranormal you won’t care for Insidious? No, especially since the similarities vanish around the movie’s halfway mark. Not that this makes Insidious much more original, as it essentially just changes influences; instead of Paranormal, the film’s second half comes across as influenced by Poltergeist. And when I say “influenced”, I mean “really influenced – really really really influenced”. As in, “openly lifts from” influenced. 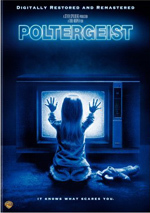 Perhaps I may be overstating the similarities, as Insidious is more of a traditional horror film than the fantasy thrill ride of Poltergeist, but I think it’d be hard to deny how much the film’s second half shows the Poltergeist influence. Not that this makes Insidious unenjoyable on its own, though I like the Paranormal half a lot more than the Poltergeist section. This should come as no surprise; it’s easier to improve on a bad film than on a good one, so it’s harder to pull off the Poltergeist elements in a satisfying manner. It does mean Insidious is most satisfying in its first half. That part builds slowly but well. While not much faster-paced than Paranormal - and with some of the same character flaws – it seems better acted and more intriguing. Nothing much ever happens in Paranormal, whereas Insidious delivers the occasional jolt and a story that feels like it’s moving somewhere. Unfortunately, when it enters the Poltergeist realm, it loses much of its impact. That half of the film tends to feel more silly than scary, and its ventures into an alternate realm are just too goofy to be effective. It’s like someone wishes that we could’ve been in the other world with Diane and Carol Anne and based much of a movie around it. That’s better in concept than in reality, unfortunately, and it zaps Insidious in a bad way. This is a shame, as the flick’s first half shows real potential for a satisfying experience. Heck, those parts do satisfy, but the movie loses its way too much for the overall result to be effective. Insidious ends up as an occasionally good but inconsistent horror effort. 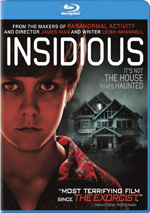 Insidious appears in an aspect ratio of approximately 2.40:1 on this Blu-Ray Disc. This wasn’t a killer presentation but it usually looked quite good. My only complaints related to shadows and blacks. Dark tones sometimes were a little faded, and low-light shots could be somewhat tough to discern. That was probably intentional but since the movie came with tons of those elements, the dimness of these scenes could become frustrating. Otherwise, everything here was solid. Sharpness was consistently tight and concise, with virtually no softness on display. Jagged edges and shimmering failed to appear, and no artifacts or edge haloes marred the presentation. The movie suffered from no print flaws, and colors were positive. As expected, the palette tended to be chilly and desaturated; some brighter hues showed up early on – and colored lights appeared later - but the movie often bordered on monochromatic. I wasn’t wild about the slightly inky blacks and lackluster shadow detail, but I still felt the image was more than good enough for a “B”. Expect a pretty standard “horror mix” from the film’s DTS-HD MA 5.1 soundtrack. 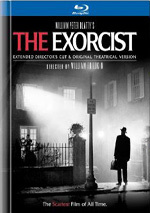 Much of the movie went with creepy atmosphere and the occasional jolt effect. These elements cropped up from the side and rear speakers in a satisfying manner, as they were well-placed and gave the movie the requisite bang and rattle. Music also boasted good stereo presence and contributed to the expected scary bits as well. Only some minor extras pop up on the Blu-ray. Horror 101: The Exclusive Seminar goes for 10 minutes, 27 seconds and provides comments from screenwriter/actor Leigh Whannell and director/editor James Wan. The show examines the movie’s development, story and characters, pacing and tone, its genre elements and the depiction of horror. It seems a bit pretentious to call this an “exclusive seminar”, but “101” does offer a good look at Insidious and how it fits into the horror field. Whannel and Wan pat themselves on the back a little much, though, as I think they believe their movie’s more original than it is. On Set with Insidious lasts eight minutes, 15 seconds and features Wan and Whannell. We learn about Wan’s influence on the production, cast and performances, stunts, reshoots and sets, and some other elements. Not a whole lot of hard material appears here – mostly we learn how much fun everyone had – but enough info shows up to make this a decent piece. Finally, Insidious Entities runs six minutes, 32 seconds and gives us info from Wan, Whannell, production designer/co-producer Aaron Sims, costume designer Kristin M. Burke, makeup department head Eleanor Sabaduquia, and hair department head Yesim “Shimmy” Osman. We learn about the design and execution of some of the film’s spooky characters. This becomes the most informative of the featurettes and gives us some good details. The disc opens with ads for Priest, Quarantine 2: Terminal, Battle: Los Angeles, Breaking Bad Season Three and The Greatest Movie Ever Sold. These also appear under Previews. No trailer for Insidious shows up here. Insidious wears its influences on its sleeve and entertains for the first half, but it loses its way as it goes. The movie still has good moments but it lacks much impact during its second half. The Blu-ray provides positive picture and audio along with a minor set of supplements. We find an occasionally effective but spotty horror flick here.